One of the nicest memories I have of my late-father is standing in a queue with him, surrounded by empty Daleks, waiting to get Dr. Who’s autograph. We were at a summer fete in Norwich, in some bleak little park, and I remember that the grass was washed a vivid green by incipient showers and that the breeze had a distinctly unseasonable bite. It was 1973, so I was nine years old. As a rule, I suffered these interminable bloody fetes, and my dislike of fresh air endures to this day, but this one was different: Jon Pertwee was opening it. My dad was in a silver band that was playing at the event, the usual mix of military marches and oddly arranged classic music enlivened today by an enthusiastic imitation of the BBC Radiophonic Workshop with trumpets, tubas and trombones. It was a Lads’ Club band, made up mostly of working class Methodists like him, and, much to my mother’s chagrin, many Saturdays – when City weren’t playing at home – were, in her view, wasted on such commitments. Although I’ve mentioned my father with great affection a few times in this blog don’t think that we were close back then. We weren’t. He was a nervous, disappointed man and prone to fits of incendiary violence, and as my sisters were both twenty-odd years older than me, it wasn’t difficult to figure out who was the mistake. But this was one of those peaceful moments, because if there was one thing we agreed on it was Dr. Who. We watched the show religiously together every Saturday night, and had done since Patrick Troughton regenerated, at which point I was deemed old enough, having survived a morning matinee with Peter Cushing and Roy Castle without undue trauma. My father was normally too reserved to make an adventure out of this sort of thing, but he was on good form that day as playing in the band always made him happy, so we peered through the wire mesh of the Daleks’ heads together, checking to see if there were any mutated horrors inside. Pertwee was wonderful. He had arrived in ‘Bessie’ – the canary yellow Ford roadster – in full Edwardian costume, and stayed in character the whole time. When it was our turn he made me blush with shy pride by noticing my UNIT club badge, and then made a joke about noses that delighted my father, who had a similarly giant hooter to Pertwee’s that I have since inherited. I received an 8” by 10” headshot, for free, which he signed there and then and which I still have, and then we went home and watched him on the telly. Dr. Who is like James Bond or Batman, so whoever was playing the character when you discovered him is most likely to be your favourite, however skilful or elegant the subsequent interpretations. This is why, for me, just as Sean Connery will always be James Bond and Adam West is Batman, whenever I think of Dr. Who my default image is Jon Pertwee, even though I have stuck with all the others, good and bad, ever since. Anyway, the reason I raise this is that I’m getting the same kind of buzz from Peter Capaldi’s performance that I remember from being a kid, when the Doctor was personified by middle aged, Dickensian British character actors, any of whom could have been H.G. Wells’ original Victorian time traveller, rather than cheeky metrosexuals. Not that I didn’t love David Tennant’s Britpop Doctor like everybody else (I mean, we all thought Jarvis Cocker would’ve been a good one, right? ), but I’m relating to Capaldi more and felt the need to stick my oar into the debate regarding the casting decision. Please don’t ever accuse me of being a bloody ‘Whovian’ though – for me, Star Trek always had the edge. (And call me a ‘Trekkie’ and I’ll thump you as well.) As with every other Brit who was a kid in the 60s, Dr. Who has just always been part of my cultural wallpaper, and right now it’s getting really good again – dark, gothic, and morally ambivalent, just like the old days. There’s so much polarised chatter about the casting of Peter Capaldi flying about, but I can’t help feeling that there’s a point being missed here – several, in fact. Think about the genius of this appointment for a minute. The show had just turned fifty, and the re-brand was into, what, it’s tenth year, give or take, with the Doctors, like policemen and politicians, getting younger every year. Christopher Eccleston, David Tennant, and Matt Smith were all inspired casting choices, with each persona utterly unique yet somehow connected, which was always the beauty of this character, who is narratologically designed to not only withstand but embrace changes in actor as the show progresses. Head Writer Steven Moffat must have been under huge pressure to keep raising the bar, and he did it by returning to the ethos of the original 1963 Doctor, William Hartnell, and making the 12th incarnation older, wiser, frequently ruthless, and thoroughly irascible (I think Colin Baker was trying for much the same effect when he replaced Peter Davidson in 1984, but he was handicapped by the clown costume and the Harpo Marx haircut.) A good correlative would be Frank Miller’s re-imagining of Batman in the original Dark Knight Returns comics of the late-80s, which similarly marked an iconic character’s 50th anniversary by stripping him back to the harder-edged 1939 pulp original, who worked alone and actually used to kill the bad guys. Russell T. Davies and Christopher Eccleston did a similar kind of thing in the re-launch, but you can still see the new persona forming in that first series, before the writers and actors settled down and the new golden age began with David Tennant. Following Tennant must have been like walking on stage after Elvis or The Beatles, and casting Matt Smith (a fellow UEA graduate, but after my time) was an audacious move on the part of the producers. I recall, at the time, a similar debate among fans and media that Smith was too young to carry off the role – which he of course did admirably – just as many are now claiming that Peter Capaldi is too old. In each case, the casting decision was inspired – it took the persona of the Doctor out a whole new door, and at the same time got everyone publically arguing about the choice. Brilliant – you cannot buy publicity like this. When Capaldi was in the running, I remember thinking: 1. What a fabulous choice and 2. They’ll never pick him – Malcolm Tucker and Machiavelli; the man behind Franz Kafka’s it’s a Wonderful Life, Uncle Rory, the Angel Islington…? No chance. Then, one evening down at Mockingbird’s End, I was working out the back when I heard my wife shouting. Assuming a family emergency I went rushing through the house only to find her dancing around the living room shouting, ‘They’ve picked Peter Capaldi!’ while our two year old boy tried to join in, aware, as toddlers are, that something important has just happened, although he had no idea what. Soon Facebook was alive with spirited impersonations of Malcolm Tucker swearing at Daleks. F***ing marvellous! At a stroke, the franchise was reinvigorated, in a way that makes one appreciate how clever the A-list scriptwriters and producers are in television, whether or not you like the shows. Casting Peter Capaldi as Dr. Who was a startling move, but, like any good story, when you thought it through the choice was as elegant as it was inevitable. And, now the first season has come to an end, for my money the show has delivered. The debate, meanwhile, continues. Now the Americans are complaining about his accent, apparently, which perhaps explains why he had nary a line in World War Z­, in which Brad Pitt invented the diet zombie movie. (Let’s hope they don’t chuck him out like Cheryl.) Over here, some parents are claiming that the show is far too ‘dark,’ which I’d suggest is surely the point. This is not kid’s drama, and in this season Moffat and his team have returned to the Hammer Films sensibility of the Jon Pertwee/Tom Baker era, crossed with the World War II anxieties of the Hartnell and Troughton stories (when England was repeatedly threatened, and often invaded by Nazi-like aliens, most notably the Daleks, just as US sci-fi in that period was full of Cold War allegories). Russell T. Davies brought the horror back from the wilderness years after Tom Baker, with each Doctor, like presidents and prime ministers, somehow less remarkable than the last, but lost it somewhere in a soap opera version of The Time Traveller’s Wife. The Moffat/Capaldi stories, conversely, have returned to the British Tale of Terror with a vengeance, with the notable use of gothic archetypes in ‘Listen’ (ghosts, or are they? ), ‘Kill the Moon’ (giant spiders subplot), ‘Mummy on the Orient Express’ (bandaged revenants and locked room mysteries), ‘In the Forest of the Night’ (magic realism), and the season finale ‘Dark Water’/‘Death in Heaven,’ which muddles up Dante and Milton with The Return of the Living Dead, as Cybermen claw their way up through Victorian graves in a devil’s rain while evil Mary Poppins looks on, and Chris Addison from The Thick of It has a cameo just to remind us all that there’s still a bit of the Gorbals Goebbels in the Doctor somewhere, however awkwardly nice he might notionally appear. 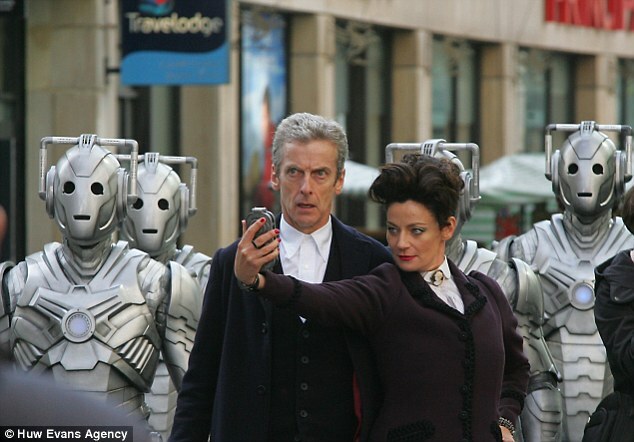 There’s a nice intertextual reference to the Cybermen marching down the steps from St. Paul’s in the Troughton story ‘The Invasion’ (1968), while the premise recalls one of the best of the Colin Baker stories, ‘Revelation of the Daleks’ (1985), in which – much like Missy and her ‘Nethersphere’ (Heaven as a Timelord hard drive) – Davros is using a giant funeral home to quietly build an army of Daleks from the dead. Previous Post Trust Me, I’m a Book Doctor: Do You Need an Editor or a Creative Writing Course?